While my boyfriend was away, I cleaned up our room and organized my fabric stocks. Then, I enjoyed making these items. It was very happy time for me. At first, I finished a custom order. 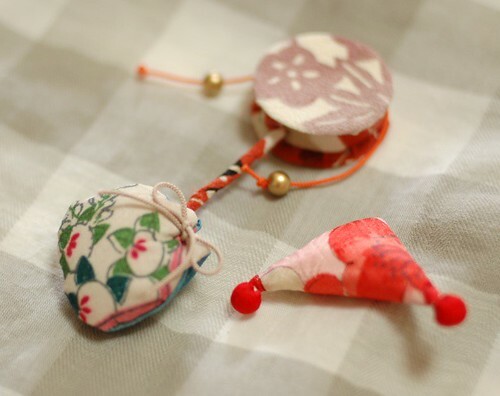 I made up these 18 small dolls for hanging. I especially like this Den-den daiko(A drum with beads which make sounds). 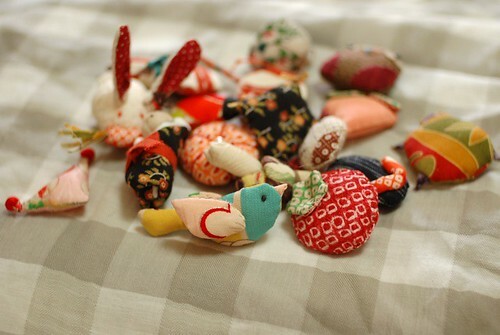 Then, I made some plushes with beads. I got these beads in one of my favorite shops and wanted to make something with them. With the other color beads, I made these elephants too. 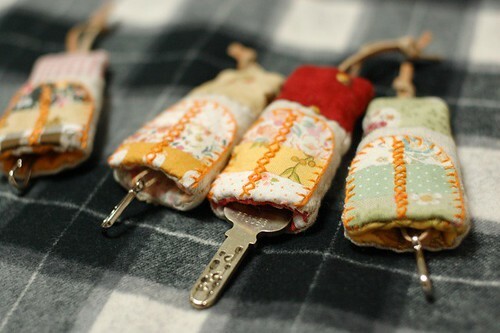 I wanted to make some more tiny items, so I made these house key cases. I put a cat on each back. I found some beautiful flower printed fabrics and laces, and I made this scarf. 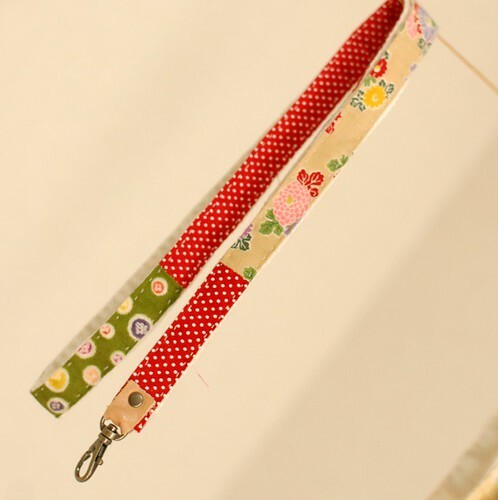 And I made these lanyards. 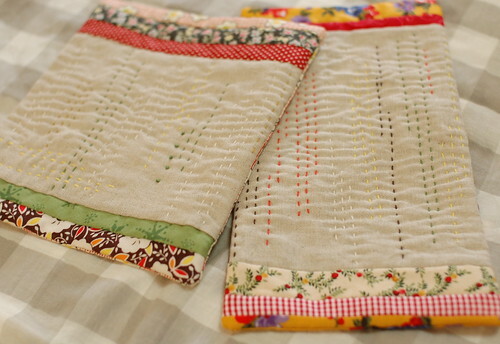 When I found this linen fabric, I wanted to stitch on it with Sashiko cotton embroidery thread. 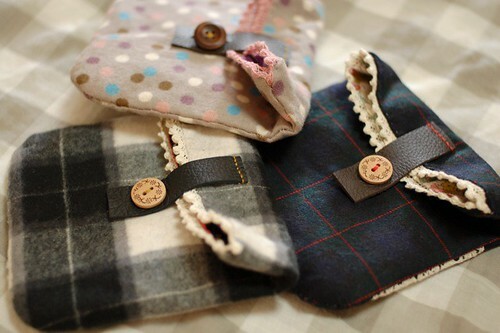 And at last, I made these pouches for winter. I used all of my favorite goods what I found in these days. Wool fabrics, laces, buttons and leather pieces. I enjoyed putting them on this little pouch. Mai, you've been working so hard! It's always a pleasure to see your work. I should work harder too, since I got my rubber, I didn't do any carving... Anyway, thanks for sharing! You have been busy, great!! A lot of beautiful work! have a happy day! Beautiful things...I love them all!Great work! 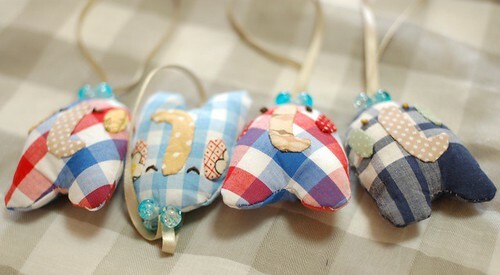 Mai, you have been so busy and you made such lovely items. 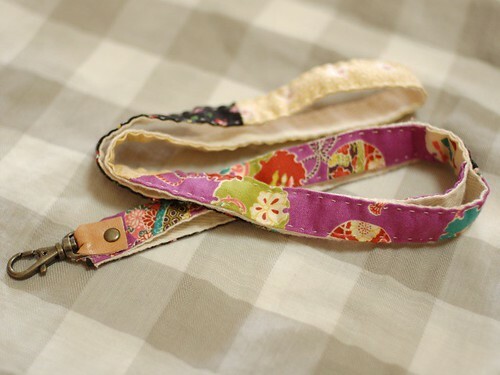 :) I adore the new lanyard...the fabrics you used are awesome. Have a lovely merry happy day and love to you! I love coming to visit your blog. My children leave for school at 7 every morning. After that, I love to tour the blogs and yours is always one of the first ones I visit. I like starting the day seeing your beautiful sewing. Thanks so much for the time you put showing us all you do. mai, you are simply amazing. you make handmade look like haute couture. Adorable stuff! I like everything, you are so talented and creative, and has such good taste! wow mai!!! what beautiful things you have made in only 3 days. maybe soon can you give us a tutorial on those cute stuffed animals? You are so very inspiring and talented! Thanks so much for sharing with all of us! They are just wonderful! I love them all :) thank you for sharing! Beautiful works as usual. I love the colors and textures on them. 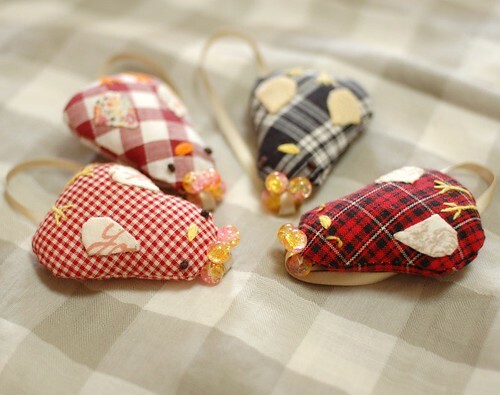 the house key pouches are adorable! Thank you for sharing! 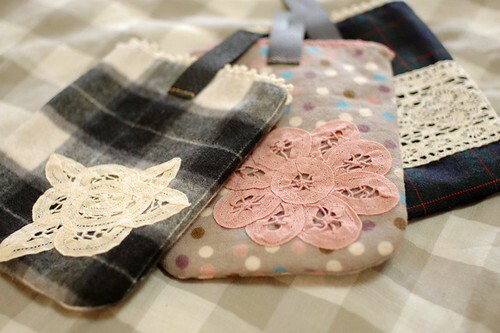 You do lovely work, which I can spend a lot of time on just sewing! The elephant plush is very comical to look at! Hehe~! Thanks for the smiles Mairuru-san. こんにちは:) and thank you for sharing your beautiful work and giving us inspirations. I always enjoy looking at your projects. You are very talented and just like everybody else around here, I just love you work! It's always a pleasure to see your tiny things. 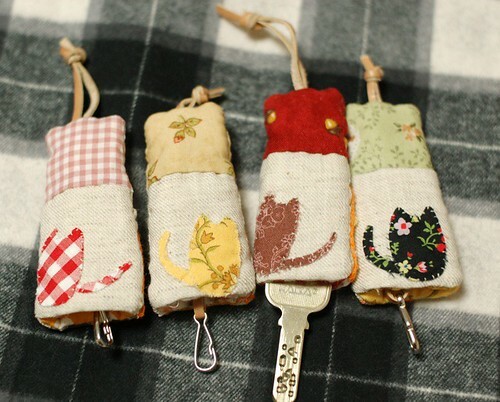 This time I love the house key pouches with the cats and the pouches with leather the best. I'm glad you had a happy time! Mai!!! You did uncredibly many things those last days, you must have been working the nights too and how sweet are all these beautiful things. So inpsiring are they all. Thanks for your inspiration Mai and greez of Corrie from Holland. Mai, what beautiful work you have done. You are simply amazing. Thank you for showing us your talent. ps. I made the chicken ham. So easy and I loved the taste. Mai! You are so clever! I love visiting your blog. I learnt making sarubobos from your blog and my daughter loves them!! Can you please post the recipes for making those tiny dolls? I want to make a bird for my daughter as she is very fond of watching pigeons. Boy, you've been very busy! Thanks for sharing...looks good. Mai! ::Sigh:: Everything you make is so lovely - I so enjoyed reading your posts - keep it up! the rest are beautifull too. 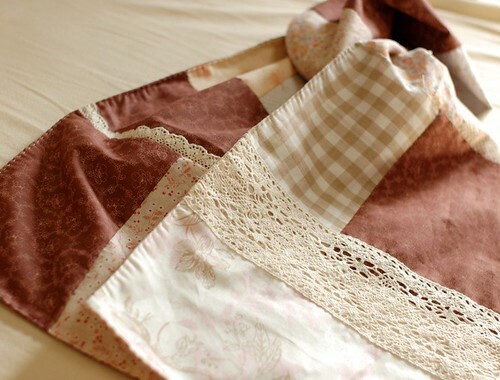 Mai, I LOVE your fabric, lace, and leather combination in the last picture! It's gorgeous! Also, I've made a couple of your softbound book covers -- I love them! Thank you so much for sharing!